1. An oncogene never codes for a cell cycle protein, which promotes cell proliferation. 2. Oncogenes are always involved in inherited forms of cancer. 3. 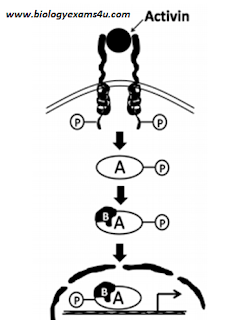 An oncogene codes for a protein that prevents a cell from undergoing apoptosis. 4. An oncogene is a dominantly expressed mutated gene that renders a cell advantageous towards survival. Ans: 4. An oncogene is a dominantly expressed mutated gene that renders a cell advantageous towards survival. 1. A receptor – enzyme has an extracellular ligand binding domain, a transmembrane domain and an intracellular catalytic (enzyme) domain. 2. Many types of receptor enzymes are found in animals. 3. 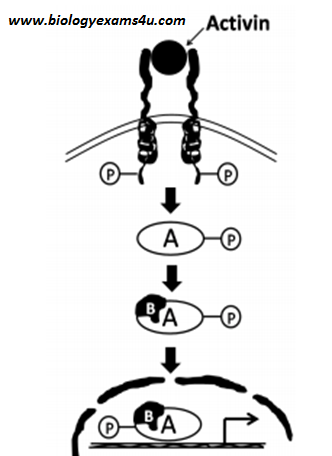 The signal transduction pathways of receptor – enzyme involve phosphorylation cascades. 4. Receptor – enzymes interact directly with intracellular G-proteins. Ans: 4. Receptor – enzymes interact directly with intracellular G-proteins.